Imagine binoculars that can record what you see. Yes, we know it’s essentially a camera with two viewing lenses, but Sony has deliver on digital binoculars. These are a bit of sci-fi in that it doesn’t seem like there is a huge demand for these and they seem a little beyond for public use. While it could be great for the bird watcher that wants to prove they spotted that rare bird or during sporting events when you’re in the nosebleed section. The DEV-50V is the second generation of Sony’s digital binoculars and—as stated above—will allow you to record whatever you’re looking at while you’re still viewing it and give you up to 25 times magnification. 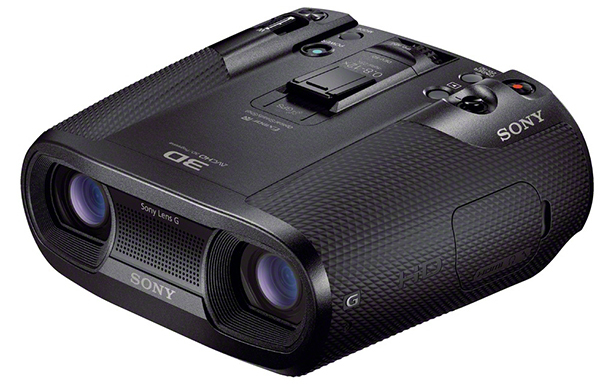 The digital binoculars come with a Sony Bionz image processor which allows you to record HD in MPEG-4 and 3D HD: AVCHD. The DEV-50V also capture 20.4 megapixel still shots and has a built in microphone and a monoral speaker. Everything can be recorded to memory sticks or SD memory cards if you have them. Need more features? The DEV-50 has Optical SteadyShot which allows for the shot to be stabilized even when dealing with jostling and shaking and resulting in a clear image. There’s also autofocus for those of us who like to set things to get the best shot, sound, video, etc. DEV-50 comes with Exmor R which is an image sensor that can adjust brightness if it’s a low-light scene or brightly lit one. Being compatible with Sony Bravia technology, the DEV-50 gives you the ability to share your recordings via HDMI output on TV. To top everything off, the DEV-50 is waterproof, dustproof, and weighs in at just 1 pound and 10 ounces. It’s said that Sony will release the binoculars in June with a price tag of $2,000. So basically it is a camera or binoculars in name and structure only. The DEV-5 allowed for 10 times zoom and 7.1 megapixels, so it’s definitely an improvement. The price tag isn’t too much considering what it can do and while you could definitely get a solid digital camera for less or a top line one for a little less-to-same amount, the 25 times zoom seems extremely handy. The uses for the DEV-50 are pretty much endless, but taking this out while hiking and trekking would probably be the best test for it given that it’s water and dustproof. Also, some venues prohibit video recording, these binoculars could prove very useful especially if you’re up in the cheap seats. The DEV-50 would definitely be worth picking up if you have the funds for it. They can be used for a variety of things. The one downside to these is that the $2,000 tag could be very off-putting.